Consult Lifts is a specialized supplier in service lifts for utilization in restaurants, hotels, hospitals and private homes and offers various different types of service lifts for different applications. 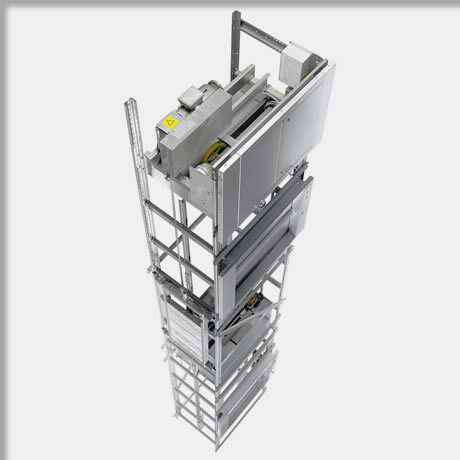 90% of our service lifts are made from pre-installed components. Therefore the installation times are reduced on site by 50%. Thanks to a ingenious method of construction our service lifts can be used for almost any purpose and can be made according to your specification. 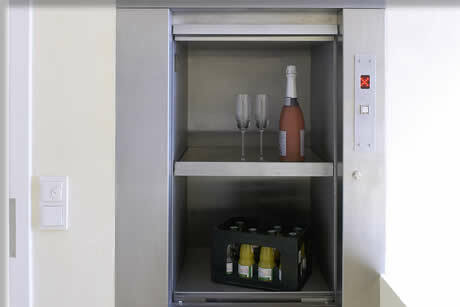 Consult Lifts are providers of Service Lift solutions in Scotland. Self supporting steel structure, made of cold rolled special profiles, fully galvanized, pre-assembled in 2m sections including trunking. Galvanized, guides on both sides with adjustable guide shoes. Units at serving height are provided with a removable shelf, car dims available in increments of 25mm. Depending on type of lift bi-parting or single hinged doors accordance with DIN 18092 resp. 18090 are provided, with a galvanized finish and specially tested door locks. Bi-parting doors with safety door pulleys made of aluminium and 3mm diameter ropes. All doors are provided with door surrounds, ready for installation. Incorporates a steel frame and 50 x 50 steel inserts. Four adjustable guide shoes with polyamide inserts. Hinged galvanized door, incorporating a lock. 50 - 100kg capacity with sheave for 2 ropes 200 - 300kg capacity with 2 chains. Drive unit with hand wheel and disc brake, insulation type IP 54 3 ph 400 V 50 Hz.